The MSN program of the college is accredited by the Commission on Collegiate Nursing Education for the term of 10 years through June 30, 2023. The Master of Science in Nursing program at the University of North Alabama is a post-baccalaureate degree program consisting of three tracks: Nursing in Teaching-Learning Environments, Nursing Leadership in Organizational Environments, and Family Nurse Practitioner Track. The program is completely online. Will equip registered nurses with tools that will enable them to facilitate the education of nursing students, health care clients, and health care colleagues. Will qualify graduates to serve as a faculty member in an institution of higher learning and serve as an educator in the clinical environment. Will prepare graduates to function at an advanced level in the health care environment regarding politics and legislation, budgeting and economics, and leadership and management, such that these nurses may positively impact the management aspects of nursing and health care in society. Students in the Family Nurse Practitioner option will receive educational preparation that will enable them to provide patient-family centered, evidence-based health care for individuals across the lifespan. The Teaching-Learning option seeks applicants who wish to assume teaching positions in both collegiate and non-collegiate academic settings, as well as in clinical settings. Students will receive education with a theoretical basis in teaching methodologies, learning assessment, evaluation of learning, and other components of effective education. Additionally, students will learn to develop curricula and create other teaching projects. Clinical practice will take place in both academic and health care settings with approved preceptors in the student’s geographical area. Clinical courses will focus on a particular area of nursing (adult health, pediatrics, psychiatric, etc.) chosen by the student. The Leadership option seeks applicants who are currently in management, administrative, or executive positions in health care or those who wish to seek such positions. Students will learn sound, theoretically based economic and management principles that will allow them to function efficiently in the business aspects of the health care system and make informed, evidence-based decisions. Clinical practice will take place in health care settings with an approved preceptor in the student’s geographical area. Applicants are accepted to begin the program in the fall, spring, and summer semesters. Applicants are encouraged to submit their application for admission 2-3 months prior to their desired start date. Bachelor of Science Degree in Nursing from a professionally accredited institution in the U.S. Completed College of Nursing admission application (see "How to Apply" below). For international students, a minimum score of 550 on the paper-based Test of English as a Foreign Language (TOEFL) or a minimum score of 213 on the computer-based TOEFL. Conditional admission may be considered on a case-by-case basis for the applicant who does not fully meet admission requirements. The conditionally admitted student must have three years of full-time experience as a registered nurse. All students are expected to have a physical examination, proof of hepatitis B and other immunizations, current tuberculosis screening, a current Basic Life Support card, a notarized felony affidavit, and current student liability insurance prior to beginning clinical courses. Students must also hold current licensure (unencumbered) in the state(s) in which clinical experiences will be completed. The appropriate forms with these items documented are to be submitted by the first day of classes. This online program does not lead to any professional licensure or certification that would be regulated by your state board of nursing. Our program does include clinical requirements which are completed in your community under the supervision of a preceptor who you will secure with assistance from the course instructor. If your state Board of Nursing (BON) requires approval of a supervised field experience, such professional approval requirements remain in effect. Please contact your BON if you have any questions about this requirement. If you or your state’s BON have questions about the program, please contact Dr. Kristy Oden, kooden@una.edu. UNA is a member of Southern Regional Education Board's Electronic Campus. For more information about the Electronic Campus, please visit http://www.electroniccampus.org. 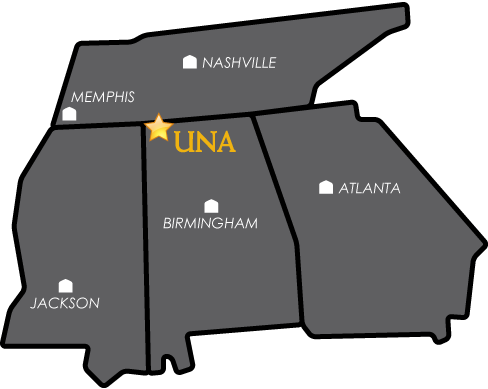 UNA has been approved by Alabama to participate in the National Council for State Authorization Reciprocity Agreements. NC-SARA is a voluntary, regional approach to state oversight of postsecondary distance education.